Several retrospective studies have shown that the antitumor efficacy of capecitabine-containing chemotherapy decreases when co-administered with a proton pump inhibitor (PPI). Although a reduction in capecitabine absorption by PPIs was proposed as the underlying mechanism, the effects of PPIs on capecitabine pharmacokinetics remain unclear. We prospectively examined the effects of rabeprazole on the pharmacokinetics of capecitabine and its metabolites. We enrolled patients administered adjuvant capecitabine plus oxaliplatin (CapeOX) for postoperative colorectal cancer (CRC) patients and metastatic CRC patients receiving CapeOX with/without bevacizumab. Patients receiving a PPI before registration were allocated to the rabeprazole group, and the PPI was changed to rabeprazole (20 mg/day) at least 1 week before the initiation of capecitabine treatment. On day 1, oral capecitabine (1000 mg/m2) was administered 1 h after rabeprazole intake. Oxaliplatin (and bevacizumab) administration on day 1 was shifted to day 2 for pharmacokinetic analysis of the first capecitabine dose. Plasma concentrations of capecitabine, 5′-deoxy-5-fluorocytidine, 5′-deoxy-5-fluorouridine, and 5-fluorouracil were analyzed by high-performance liquid chromatography. Effects of rabeprazole on inhibition of cell proliferation by each capecitabine metabolite were examined with colon cancer cells (COLO205 and HCT116). Five and 9 patients enrolled between September 2017 and July 2018 were allocated to rabeprazole and control groups, respectively. No significant effects of rabeprazole on area under the plasma concentration–time curve divided by capecitabine dose for capecitabine and its three metabolites were observed. 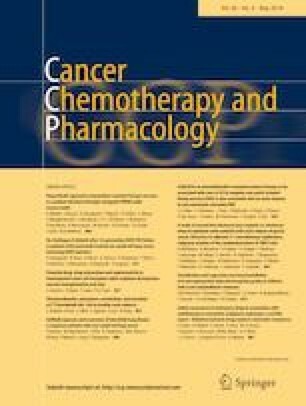 Rabeprazole did not affect the proliferation inhibition of colon cancer cells by the respective capecitabine metabolites. Rabeprazole does not affect capecitabine pharmacokinetics. The online version of this article ( https://doi.org/10.1007/s00280-019-03837-y) contains supplementary material, which is available to authorized users. We would like to thank Ms. Mayu Kato for her various assistance in the clinical pharmacokinetic study, and also to thank Editage for English language editing. The study protocol was approved by the Institutional Review Board of Showa University. All patients gave written informed consent for the use of their peripheral blood samples and medical information for research purposes. The study was registered on University Hospital Medical Information Network-Clinical Trials Registry Japan (UMIN000031182).